One of the biggest complaints among would-be homebuyers is that the kitchen doesn’t have enough storage. Unless you have walls of cabinets to hold all your food, pots, pans, dishes, and appliances, it’s pretty easy to run out of space, especially if you like to cook and bake and try out new cooking tools. That’s when an island really comes in handy. A kitchen island offers extra counter space for both storage and food preparation. If it has built-in drawers, shelving and cabinets, then you’re talking about a lot more areas to stash items. If you’ve got the room, you can customize a permanent island to include as much space as you like and in an arrangement that will accommodate your specific needs. However, your kitchen may not have the space for a permanent structure. Or you rent and don’t have the authority to construct something like an island. But neither scenario means you have to abandon the idea of featuring an island in your kitchen. A portable kitchen island is often sized just right and can go with you if you relocate. If you’re considering buying an island, one of the first things you need to figure out is how big you can go. Of course, you must account for the permanent features—cupboards, stove, fridge, etc.—but also calculate in the room you’ll need to move around. This is important because any benefit you receive from extra prep area can be negated if you have to squeeze past it all the time. Start by measuring the area of the free space in your kitchen where you’d like to use the island. 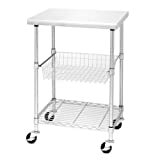 Allow at least 36 inches plus another five or so for comfortable maneuvering space between the island and other counters or appliances depending on your personal needs. Subtract that from the free space area figure and that’s basically the maximum size of island that will comfortably fit in your kitchen. These give you mobility so you can move the island to the best position while cooking and then back out of the way when not in use. For extra safety, look for a design that allows the wheels to be locked in place. The type of counter you choose should be dictated by the type of work you do on it. Butcher blocks are fantastic cutting surfaces. Granite can withstand hot pots for brief periods. There are islands with counter hangovers that can double as a breakfast bar or extra seating, which is super convenient if your home doesn’t have an eat-in kitchen or dining room. Do you want shelves, wine storage or even a microwave shelf? Islands come in many different shapes, sizes and storage options. Some designs may offer towel racks, a spice rack or knife holders. Find the model that provides what you want for your kitchen. Don’t let the simple utility design of this cart fool you. A stainless steel counter is a great prep surface, a basket shelf is ideal for storing produce that needs airflow, and a bottom shelf can hold pots, pans, or anything else you want. Two lock wheels keep everything in place. The rectangular shape gives you more countertop space than a square design, but the elongated style means it can fit into narrow, galley style kitchens. It also offers two drawers, an open middle shelf, a lower cabinet, and locking wheels.